Cooking outside is a super fun and often memorable experience. Something about preparing food outside of the comfort of your home kitchen is exhilarating, and you can often taste the adventure and excitement in the final dish. Outdoor cooking can range drastically, from the deluxe gas grill on your patio, to a rustic open fire. Cookware (i.e pots and pans). Before you pack up your gear and hit the road, make sure you know what you will be working with. If your campsite comes with a grill, you probably will not need pots and pans, but if you are building a cooking fire yourself, you may want to make the investment. These kits contain the items you will actually be eating off of, so make sure the colors and designs seem appetizing to you! 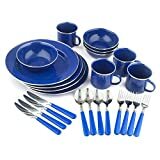 This is a 24 piece set that comes with 4 plates, 4 bowls, 4 mugs, and 4 flatware sets that include a spoon, fork, and knife. The tableware itself is made out of high-quality steel with an enamel finish, which means it is highly unlikely to scratch or break. It is a great choice for picnics or even a camping trip with a nearby washing station. There are a lot of pieces to keep track of, so make sure you have a good storage solution. It is an Amazon Choice item so you can definitely feel confident in your purchase! This mess kit is slightly smaller, at only 16 pieces. It comes with 4 plates, 4 bowls, 4 cups, and 4 sporks (fork/knife combo). It is made of lightweight, eco-friendly polypropylene, which means it is light to carry and easy to clean, and even comes with it’s own mesh carrying bag. This is a great solution for anyone looking to reduce the quantity and weight of the items they are bringing with them on a camping trip. It also comes in 4 different colors, so everyone in your party can be responsible for their own complete, color-coordinated set! These kits contain the tools you need for actually preparing your food. Everything from prep tools to cooking utensils is included, so you can bring some of the convenience of your home kitchen on the road with you. This utensil kit has a unique and clever design. The kit comes with two handles, and 6 head attachments, which include everything from spatulas to ladles to knives. All you have to do is buckle the tool you need onto the handle, and you are good to go! It all comes packed into a convenient oxford cloth carrying case, making it easy to organize and even easier to transport. This kit offers you all of the benefits of full-sized utensils but in a limited packing space. 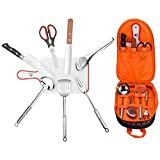 This set comes in a convenient, zip-close carrying case and contains cooking scissors, a blender spatula, a meat knife, cutting board, soup spoon, stainless steel turner, cook fork, tongs, and a small cutting board – so basically everything you may need to prepare a great meal! Everything is made of stainless steel and is easy to clean. Each tool has a specific storage spot within the carrying case. This is a great solution for anyone looking to just grab the tool they need and get cooking! The tool is fully assembled, and will always be in the same place. These cookware sets are fantastic for the serious campers and the serious cooks among us. They contain the vessels you need to prepare tasty meals under the wide open sky. 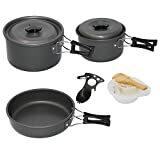 This cookware set is petite and lightweight, making it a perfect selection for avid backpackers. It contains a boiling pot with lid, a frying pan, a bamboo spoon, serving ladle, plastic bowl, cleaning sponge, and teapot. It all snaps together and packs into a lightweight mesh bag. The lightweight material means your food will cook quickly and efficiently, with the manufacturer claiming that 400 mL of water will boil in just 2 minutes and 30 seconds. All together it weighs only 1.34 lbs. 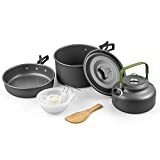 This cookware kit is super compact and is perfect for one person looking to cook fom themselves. It contains a pot, a pan, and a multi-use utensil that can function as a spoon, fork, or bottle opener. The handles on the pot and pan collapse against the body of the and pan, which nestle together and fit into a small mesh case. The pot and pan are made of lightweight aluminum, and is very easy to clean. All together, the entire kit weighs only 1.1lb, making it the perfect addition to your camping equipment. 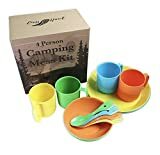 So whether you are looking to prepare a meal at a campsite, deep in the woods, on the beach, or even in your own backyard, these tableware, utensil, and cookware sets will help you to ensure that you have any and every tool you may need. So get your hotdogs, marshmallows, oatmeal, and coffee packed up and ready to go. Happy trails and Bon appetite!